We're in full Fall fever here in Virginia. The maple trees on our street are transforming into glorious painted canvases of crimson and orange. The weather is still a bit warm, but with Halloween decorations inside and out, I've been baking Fall treat recipes. 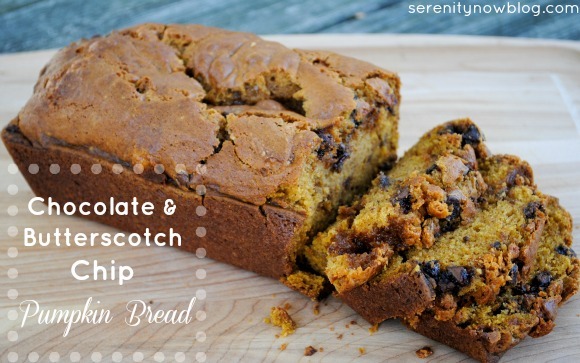 Today, I want to share a recipe for Chocolate and Butterscotch Chip Pumpkin Bread with you. The beauty of this recipe is that you can leave the chocolate or butterscotch chips altogether (or one or the other) and still have a scrumptious autumn recipe to treat your family with! The original recipe is for plain pumpkin bread, but I doctored it up this time. I've had this much-loved recipe in my files for so long that I'm not sure where it came from, but it's hand-written so I am guessing a friend shared it with me. Like pretty much everything I share here on the blog, this one is easy to do at home! You can follow the recipe for a simple (but delicious!) loaf of pumpkin bread, or something a bit more sweet. 1. Preheat your oven to 350 degrees F. Grease two 9 x 5 loaf pans. 2. Combine flour, baking soda, cinnamon, double acting baking powder, all spice, and cinnamon. Mix with a spatula and set aside. 3. In a large mixing bowl, beat the sugar and oil. Add the eggs, water, and pumpkin. Beat well. 4. Gradually add dry ingredients and stir until just blended. 5. This is where you can play with the recipe. I chose to make one plain loaf of pumpkin bread and one extra sweet loaf. I poured the plain batter into the first loaf pan and set it aside. I added a bit of plain batter to the bottom of the second pan and then sprinkled a few butterscotch and chocolate chips on top. I added the rest of the chips to the remaining batter, mixing well before pouring it over the existing mix in the pan. 6. Bake for 55 to 60 minutes, or until a toothpick inserted into the center of the loaf comes out clean. The key to this bread is not to overdo it with the chips. I love me some chocolate, and I usually disregard measurements for chocolate chips, just dumping them in at will. But pumpkin bread is already pretty sweet, so I just wanted to add some chips to add a little pop. The girls love to have a slice of pumpkin bread for breakfast with some eggs and a banana! I shared another variation of pumpkin bread here at Serenity Now if you're interested: Nutella Pumpkin Cheesecake Bread! 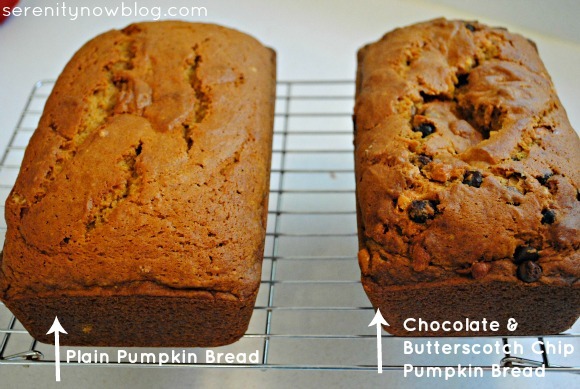 Does Pumpkin Bread say "Fall" to you? If you enjoyed this post or found it helpful, I hope you'll click your "Pin It" button to add this post to Pinterest, or even a +1 for Google+. Pumpkin anything says fall to me! :) I love the idea of adding some chips though, thanks for sharing the recipe! 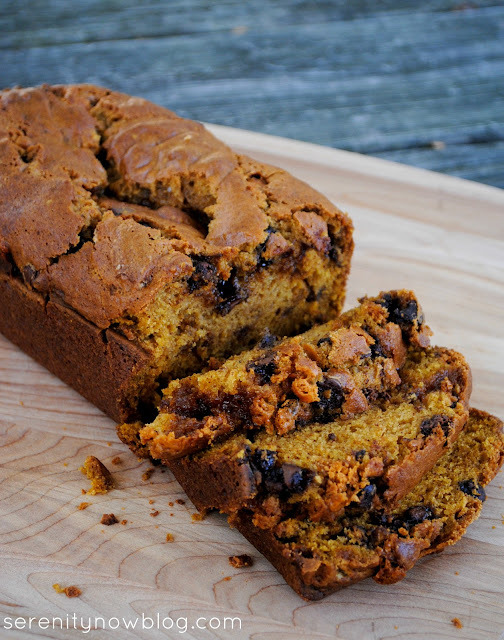 Pumpkin bread definitely says fall to me! With or without chocolate chips, it looks great. I know I'd have a hard time staying out of it. Yes, Pumpkin bread says "Fall" to me also. Sounds ymmuy, thinking to give it a try this weekend. I know that chocolate chips in pumpkin bread are very popular, but that particular taste combination has never zinged me. I made it once or twice when my kids were little, but none of us ever preferred it to plain pumpkin bread. But I've never in my life thought about butterscotch chips. Now THAT combination sounds a lot more winning to me! I love butterscotch chips, yet I never think to add them to anything--I can imagine they'd be great in pumpkin bread! Thank you for the inspiration! Think you could skip or substitute the Pumpkin? Other than my dislike of pumpkin these look/sound really yummy!! Mmmmmm This sounds delicious! May just have to try it! Wow - yummo!! I love quick breads like this! Great combination! Looks delicious! We've followed your copyright policy and will be linking to one of the images in this post here (http://www.highschoolpieces.com/2012/12/8-fun-fall-activities) on Monday December 17, 2012. Thanks so much for having such an accommodating policy.